Antique terms and meanings beginning with the letter ‘I’ covering everything from imari to intaglio and ivory. Art glass formed with a frosted surface that resembles cracked ice. Made by rolling partly blown molten glass over powdered glass, then reheating it and blowing into shape. Also — by plunging white-hot molten glass into cold water to produce veined tiny cracks. Also – crackle glass, frosted glass, or verre craquele. Imari is the name given to the world famous Japanese porcelain produced in Arita, Hizen province (modern Saga-prefecture) on the Island of Kyushu. 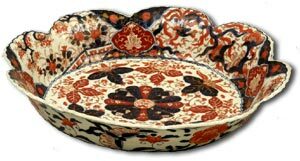 The name Imari was taken from the Japanese port town from which the porcelain was shipped to other parts of Japan and abroad by the Dutch. Imari porcelain was first made in the late Momoyama/Early Edo period (turn of the 17th century). It is generally believed that the naturalised Korean potter Ri Sampei (1579-1655), who had been brought to Japan in 1598, found clay for porcelain production at Izumiyama near Arita, and fired the first plain white and the first underglaze cobalt blue porcelains in Japan. Sampei established a kiln at Tengudani, and from then on Arita developed until the area grew to rival Ching-te Chen in China as a production center of fine porcelain. Furniture decoration usually having scales lapping one over the other, or a representation of such scales. Also – Impasto is a technique used in painting where paint is laid on an area of the surface (or the entire canvas) very thickly, usually thickly enough that the brush or painting-knife strokes are visible. Paint can also be mixed right on the canvas. When dry, impasto provides texture, the paint coming out of the canvas. Oil paint is most suitable to this technique, due to its thickness and slow drying time. Acrylic paint can also be impastoed. Impasto is generally not possible in watercolour or tempera without the addition of thickening media such as Aquapasto™, due to the inherent thinness of these media. Impastoed paint serves several purposes. It makes the light reflect in a particular way, giving the artist additional control over the play of light on the painting. It can add expressiveness to the painting, the viewer being able to notice the strength and speed applied by the artist. Impasto can push a painting into a three dimensional sculptural rendering. The first objective was originally sought by masters such as Rembrandt and Titian, to represent folds in clothes or jewels: it was then juxtaposed with more delicate painting. The French impressionists created entire canvases of rich impasto textures. Vincent van Gogh used it frequently for aesthetics and expression. Abstract expressionists such as Hans Hofmann and Willem De Kooning also made extensive use of it, motivated in part by a desire to create paintings which dramatically record the action of painting itself. More recently, Frank Auerbach has used such heavy impasto that some of his paintings become almost three-dimensional. English cabinet-makers William Ince and John Mayhew worked together from 1759 onwards. Their early ornate work in Rococo style later developed along more restrained neoclassical lines. The partners published The Universal System of Household Furniture, which contained over 300 designs similar to those of Thomas Chippendale. Ince and Mayhew also built furniture based on designs by Robert Adam . A type of decoration were a design is cut or carved into the surface an the item, probably with a sharp metal point. A design impressed into the surface of a coin to create an intaglio effect rather than a relief design..
German for ‘Indian flowers’ – a term for painted floral decoration on ceramics inspired by Oriental and more specifically kakiemon, originals. The designs were introduced at meissen in the 1720s, and imitated by other European factories including chelsea. From the 1740s indianische Blumen were superseded by deutsche blumen (German flowers). Large, heavily woven pile carpets produced in northern-Indian jail workshops in the 19thC. The industry thrived in response to growing Western demand after examples were shown at the Great Exhibition in London in 1851. The designs were based on earlier Persian styles. Flat-weave dhurries were also woven in Indian jails – in far larger quantities than the pile rugs, as they were easier to make. British flat-weave carpets that are reversible, having the same pattern appearing in a different colour on either side. They are also known as double-cloth carpets, and have been woven since c. 1824 at many factories, particularly kidderminster, but developed mainly in the USA from 1850 . Container for writing implements, including inkpot, pounce box, sealing wax, handbell and quill pens, in use from the 16thC onwards. The implements either fit into a box or rest on a matching tray. Standish is the common term for pre- 18thC silver inkstands. Technique used on solid wood furniture, in which details of coloured woods, ivory, metal or mother-of-pearl are set into cut-out recesses some ?in (3 mm) deep. First used in 15thC Italy, the technique reached France, Holland, Germany and Britain the following century, and was popular on Elizabethan and early Stuart oak and walnut furniture. Designs were fairly simple – geometric, or using flower and vase motifs. As veneer and marquetry techniques were perfected, inlaying died out . Small container designed to hang from the belt, worn by Japanese men from the 14thC. The original purpose was to hold a seal- the word is literally translated as ‘seal basket’ -but inro were later used for other personal effects such as medicine or tobacco, and by the 18thC had become purely decorative. Inro are usually of lacquer on wood, typically 3-5 in (7.5-12.5 cm) long, shallow and oval, and made up of several close-fitting compartments . Decorative technique (or object made by the technique) of incising a figure or design into the surface of hards tones (as in seals) and glass (see engraving, wheel) especially, and also ceramics and metalwork. Intaglio is the opposite of cameo work, in that the design, not the background, is cut away to give an image in relief . An Italian term for pictorial MARQUETRY or INLAID DECORATION found on 15th and 16thC Italian panelling and furniture. Various woods, tortoiseshell, metals and ivory were chosen for colour and texture to create a realistic architectural perspective, or a symmetrical still-life group of objects such as musical or precision instruments . Decorative technique which involves painting a watercolour picture on the inside of a bottle using an angled brush inserted through the neck. It was particularly popular for decorating snuff bottles. Glassware that appears to be rainbow-coloured when viewed from certain angles and in certain lights. Ancient glass which has been buried often develops a natural iridescence due to attack by minerals in the soil. The same effect has been created artificially by treating glassware with metallic oxides. Heavy, ornate lead crystal, produced from c. 1780 in Belfast, Cork, Dublin and Waterford following the removal of a ban from exporting glass from Ireland and to avoid the high taxes payable in England. English factories at stourbridge, Sunderland and St Helens have recently been identified as the source of much of the glass previously described as Irish. Ornamental style applied throughout the decorative arts both in Middle-Eastern Islamic countries, North Africa and Spain. It is in abstract style – often colourful, symmetrical patterns with inscriptions or kufic script – because the Koran forbids the representation of Allah, the human form and animals. In 15thC Spain following the Moorish (Islamic) occupation, Islamic style was combined with Christian gothic in the Mudejar style. Coarse-bodied Turkish earthenware, either coated with a white slip or tin glazed, decorated with bright, high-temperature colours under a glassy quartz glaze. Bright blue, green, turquoise and an impasto red were typical, and blue and white Chinese-inspired wares were also made. Production centred on Isnik (ancient Nicaea), 60 miles (95 km) south-east of Istanbul, from the 15thC onwards. Quality declined in the 17thC, but the style was copied in Europe from the late 19thC. A clock-making term meaning equally beating, that is, each beat occupying an equal period of time. A pendulum is naturally isochronous, while a balance wheel only becomes so when linked with a balance spring. Tin-glazed earthenware, particularly Italian maiolica, with a scene from a historical, mythological or biblical story. Literally translated as ‘with a story in it’, istoriato was introduced in the early 16thC. It represented a move from the production of purely practical wares to articles designed for display. Hard, dentine tissue from the tusks of elephants and other mammals. From the earliest times ivory was used in China for carvings and in Japan for netsuke figures, as a base for miniature paintings and for decoration. In the West, ivory has been used for ornaments, jewellery and furniture. Its use declined in the 15thC but interest was revived in the 18thC, especially in the Victorian era. See morse ivory. Cream-coloured glass wheel-engraved or moulded to look like carved ivory. The engraving was treated with a coloured stain to highlight details of the design, and some pieces were then decorated with gilding or enamelling. The technique was applied to various ornamental wares, some in Oriental styles, and was a speciality of Thomas webb & Sons in the late 19thC. Ivory-coloured, slightly iridescent art glass developed by the designer Frederick carder during the 1920s. The colour was created by adding the minerals feldspar and cryolite to molten glass, and the iridescence was achieved by spraying the finished object with tin chloride and then reheating it.